Despite its isolation from major land masses, Guam has a number of interesting forms of animal life. Introduced deer and wild pigs inhabit jungle areas, as well as domesticated Carabao, or water buffalo, that can be seen lounging in cool streams on sultry days. We have shorebirds, such as the American Golden Plover, Gray-tailed Tattlers, and the Mongolian Dotteral. 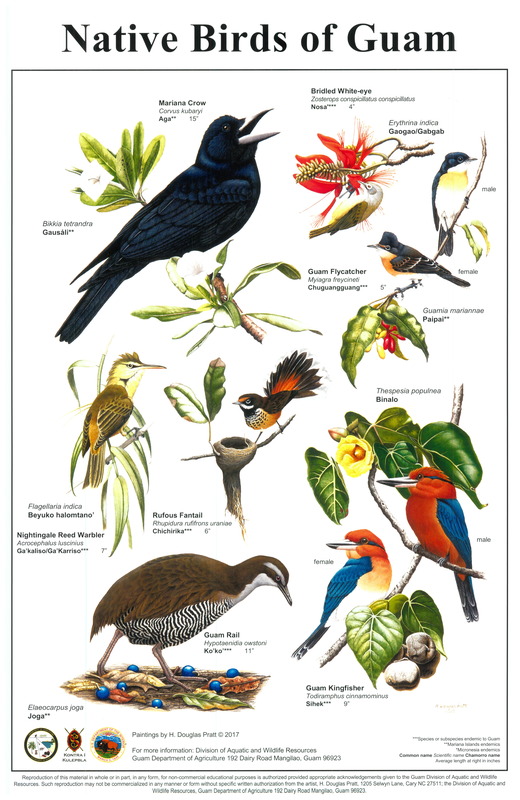 Rare and beautiful birds, such as the rose-crowned fruit dove, king fishers, and the Guam Rail, are endangered species. 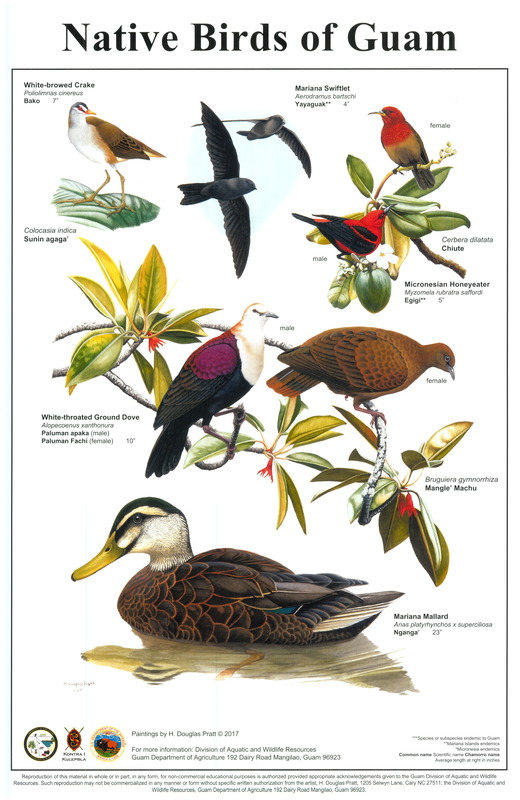 Catch a glimpse of the Mariana Swiftlet or the Mariana Mallard. 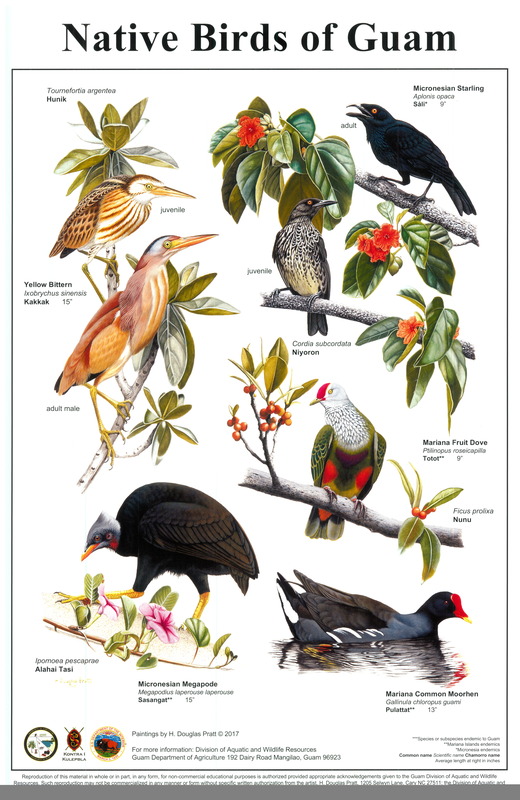 Other native birds of Guam include the Mariana Fruit Dove and the Micronesian Megapode. Wild chickens make every neighborhood their home, and their early morning cries serve as alarm clock for many island residents. Small, harmless lizards called geckos, blue-tailed skinks, and chameleons patrol our homes and gardens, searching for insects. Occasionally, monitor lizards known locally as hilitai, can be seen darting across roads, especially in the northern part of the island. Despite their popularity on the dinner table, the endangered fruit bats (fanihi) still dwell in caves in the northern tip of the island, though in greatly reduced numbers. Coconut crabs (ayuyu) prowl the grounds at night. Exotic African land snails leave silvery trails on garden paths and multicolored butterflies flutter from one exotic flower to another. Although Guam has a tremendous amount of fauna diversity, the non-poisonous brown tree snake, introduced to the island sometime after the Second World War by cargo ships has become an unwelcomed predator and pest. According to biologists, these brown tree snakes indigenous to Papua New Guinea and the Solomon Islands have virtually eliminated many bird species. The government has spent millions of dollars in attempts to eradicate the pest, and it looks as though it is beginning to work.